All our snow is gone now. We got a couple inches of rain last night. In one night we went from a foot of snow to almost no snow at all. I had opened my winter tunnel to the rain and air for the past couple days. The soil looks nice now. Unfortunately, the plants are still mouse-eaten and frost-killed. This morning I pulled all the damaged plants. 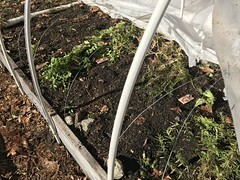 The mice ate parsley roots, lettuce and spinach stems, and entire chard plants. My husband was up early this morning and he repaired the tunnel top pole support for me. We put down four mouse snap-traps and closed the tunnel up just as our temperature was plummeting back down to freezing at about noon. I'd like to replant my tunnel with fresh greens seedlings. In February, our sunlight will be high enough for plants to grow. I just put a dozen or so 6-packs planting pots in the dishwasher to clean them up for planting seeds. 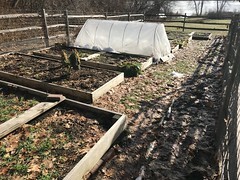 I think I'll plant spinach and lettuce indoors under lights that will be ready to transplant out into the tunnel mid February. I hope I can get rid of the mice by then. Here we started the year with a week straight of sub-zero lows and even a high below zero. I knew it wasn't going to be pretty in my cold frame, but I finally worked up the courage to open it up yesterday. No mice (whew! ), but lots of frostbite. My spinach should pull through ok, and some of the lettuce plants are (barely) alive, but everything else was just mushy. I had started some new plants indoors under lights midway through the cold snap, just in case. Looks like that turned out to be a really good idea. Now I just need some warm weather so I can start hardening off the new plants. Would it maybe work to apply some castor oil to repel your mice? Joe - Your weather sounds just like ours. Maybe castor oil will help repel the mice. Good idea. I'll spread some around. But I think of castor oil more to repel digging rodents like voles. I hadn't caught any mice in my traps when I checked yesterday. It sort of looked like there was a bit more damage to the plants though. I started up some more seeds yesterday. I have not visited your blog in several years. I had to give up gardening for a few of reasons, one is health/back issues. The others have to do with other pursuits more suited to my abilities to move, or to my limited movement. But I was thinking of you today and am so happy to see that you are still at it! I have bookmarked your page again and hope to follow you this year. Probably without commenting.